This the first entry of a number from central Europe, from a trip we took almost on impulse and for which I am thoroughly grateful. Here, though, is how it began. After a number of delays, the most frustrating of which was the drag through London Heathrow, Rhonda and I touched down at the first destination of our trip. Relieved to be off a plane for the next ten days, we found ourselves at the Liszt Ferenc International Airport in Budapest. The plane had taken us over huge, scudding clouds—sure sign of the storms that were beginning to brew over the Atlantic and would hit Ireland and the U.K. pretty hard over our visit to the continent. Yet above the cloud cover the sky was wintry blue—a color so bright and pale that it seems you would find it on ceramics rather than in the sky. And that was only the beginning of the strangeness. All around us the incomprehensible consonant-twisting of Hungarian that made me realize how much we would be at the linguistic mercy of our hosts. My second languages, you see, are dead and buried—Latin and Old English—and yet they avail in so many circumstances. I speak very little Spanish, but can understand more of it, as I can Italian and French. Thanks to the Teutonic roots of the Old English, I can read enough German to go the right way on a one-way street and recognize which bathroom is for the men. But I had no handle--absolutely none--on Hungarian, so I began by thinking that we would start in the most estranged and "foreign" of the cities we planned to visit—or, better said, in the city where we would be most estranged and foreign. Budapest was the last choice I made on the cities we would visit—a choice made largely on convenience and expense. On both counts it had seemed better than, say, Berlin or Warsaw, but I was beginning to have my doubts as our cab raced through industrial stretches of Late Soviet architecture on the way to the city center. I expected guards in ushankas, spotlights, defecting gymnasts. But of course, it was nothing like that where we were headed, as I found in daylight. Budapest, certainly at its center, has been largely restored over the last seventy years. The Germans and Russians trashed it in the last winter of World War II, and you are hard pressed to find a building that remained undamaged. That includes the castle, the Parliament, and the famous Fishermen's Bastion. After the war, the landmark buildings were restored, with limited funds but to the old designs, using archival materials to guide the reconstruction. The result is a mixture of beauties, a Parliament building that is breathtaking and a Fishermen's Bastion which, although pleasing to the eye, struck me as somewhere between a gothic structure and a Disney castle. And yet even that cobbled arrangement had something urgent in its design, as though if you didn't raise it quickly and right, something would be lost forever. It was T.S. Eliot who said, "These fragments have I shored against my ruin". It was the people of Budapest who shored their own fragments by a careful attentiveness to what had gone before, to what they remembered. It had to have been foreign to them—their homes flattened, the Soviets all over them and settling in to stay for fifty years—but what they managed to do along the Danube, guided by memory and archive, was to reconstruct an old identity out of guesswork and hope. You can see the seams between buildings, the difference in a ground floor that remained intact and the facsimile upper stories: nothing quite connects like it did in, say, the 1920s, but things have been connected in honorable and lovely ways. After all, the architects of old gothic cathedrals shored fragments by considering no work complete. Each building was a slow accumulation of what had gone before, a trust in the imperatives of both tradition and change. 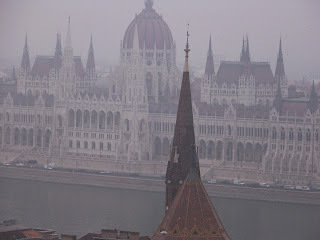 On a foggy day, like our first full day in Budapest, you could stand on the ramparts of Buda and look across the river at the government buildings of Pest, glimpsing them as you can in my attached photo, as they seemed to take shape in a fog that hovered between settling and breaking.